You might want to set aside your cornflakes for a moment now. Ed Yong writes in The Atlantic about a substance he says, quote, "looks revolting but is also one of nature's more wondrous substances, unlike anything else that's been concocted by either evolution or engineers." Ed Yong, science writer for The Atlantic, joins us now. What are you celebrating here? ED YONG: Hi. I am celebrating the slime produced by a type of fish called the hagfish. 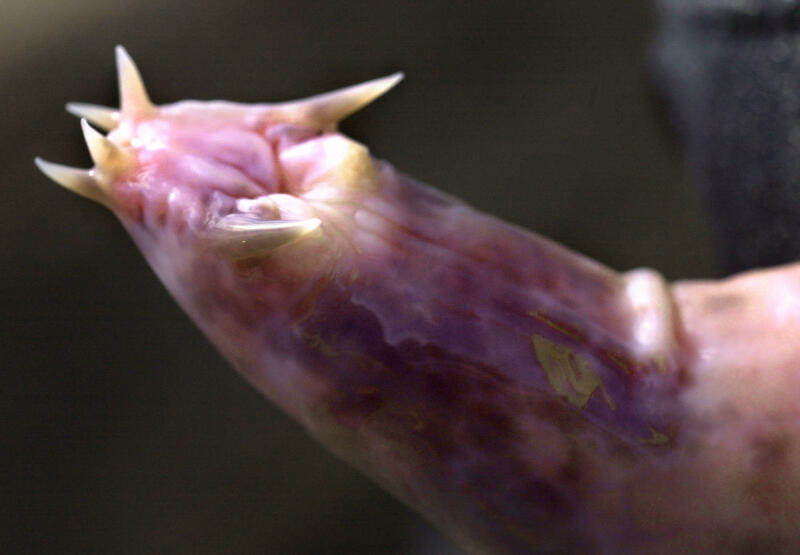 So the hagfish is, you know, a 2-foot long creature that lives in the deep ocean. It looks a bit like an eel, but it's not. It has no backbone. It has no jaws. And, most tellingly, it has the ability to produce incredible amounts of this very, very weird and unusual slime. YONG: Can neither confirm nor deny that. SIMON: Slime. A teaspoon of slime at first, but it really multiplies, doesn't it? YONG: So a hagfish will release about less than a teaspoonful of the slime from the glands on its side. But in, like, less than half a second, that teaspoonful will expand into liters of slime. If you put a hagfish in a bucket, at first, it'll look like these thin wisps of, like, white, cloudy stuff have been released from its flanks. And then, if you stick your hand in and swirl it around, you'll just be pulling out, like, handfuls of this stuff. It's almost like the entire bucket will have converted into slime. SIMON: But this is what they do to protect themselves? YONG: Right, it's a defensive measure. They release it when they're attacked or when they're stressed. SIMON: Because a lot of predators might say, ha-ha-ha, no backbone, no teeth? I know what I'm having for lunch. YONG: Right, exactly. They often get bitten and attacked. But when they do, they instantly release this massive cloud of slime which is very, very good at infiltrating nooks and crannies, including the mouths and gills of predators. So there have been these incredible videos of sharks biting hagfish and then just recoiling, their mouths and gills full of slime and just gagging and being forced to retreat. SIMON: Sharks essentially saying, I'm sorry (laughter). I'm not a Spielberg shark. They don't pay me enough to swallow slime. YONG: I think it's more like they're saying, (vocalizing). SIMON: (Laughter) Now, hagfish slime is in the news because of a new fossil, right? SIMON: A newly discovered fossil. YONG: A newly discovered fossil. The fossil is interesting because the evolutionary relationships of hagfish to other fish have long been controversial. Like, a lot of scientists have thought of them as very primitive creatures, like some sort of transition from a kind of worm-like thing to a fish-like thing. But this new fossil helps us understand that it looks like hagfish are vertebrates. They are part of the backbone lineage. They just seem to have lost a lot of the traits that we have, things like complex eyes and bones and taste buds. So rather than being this weird, evolutionary throwback, they're actually very, very well-adapted animals to the somewhat grim and grotesque life that they live at the bottom of the ocean, feeding on corpses, sliming things that might want to eat them. SIMON: Oh, boy, does that sound - ah, what a life that sounds like. YONG: (Laughter) Right. But I tell you what, I was serious when I said that it's one of evolution's marvels. I think very rarely do you see a substance with this combination of properties produced by an animal that most people have never heard of. SIMON: Ed Yong covers science for The Atlantic. Thanks so much for being with us. YONG: Thanks for having me. Transcript provided by NPR, Copyright NPR.